In an increasingly economically interdependent world, the importance of an improved legal framework for the facilitation of international trade and investment is widely acknowledged. The United Nations Commission on International Trade Law (UNCITRAL), established by the United Nations General Assembly by resolution 2205 (XXI) of 17 December 1966 (see annex I), plays an important role in developing that framework in pursuance of its mandate to further the progressive harmonization and modernization of the law of international trade by preparing and promoting the use and adoption of legislative and non-legislative instruments in a number of key areas of commercial law. UNCITRAL supports the Sustainable Development Goals. UNCITRAL's contribution to the achievement of the Sustainable Development Goals proceeds on several fronts and touches upon a number of different areas. Learn more here. 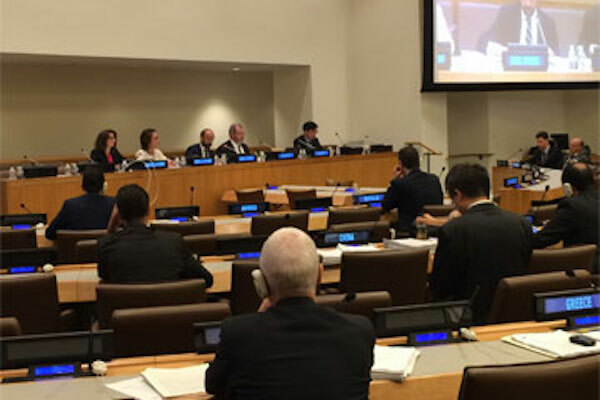 UNCITRAL provides access to reports from its six Working Groups as well as links to reports on related General Assembly and Commission sessions hosted on the United Nations Official Document System. UNCITRAL is formulating modern, fair, and harmonized rules on commercial transactions. These include: conventions, model laws and rules which are acceptable worldwide; legal and legislative guides and recommendations of great practical value; updated information on case law and enactments of uniform commercial law; technical assistance in law reform projects; regional and national seminars on uniform commercial law. In an increasingly economically interdependent world, the importance of an improved legal framework for the facilitation of international trade and investment is widely acknowledged. UNCITRAL plays an important role in developing that framework because of its mandate to prepare and promote the use and adoption of legislative and non-legislative instruments in a number of key areas. These instruments are negotiated through an international process involving a variety of participants. UNCITRAL membership is structured so as to be representative of different legal traditions and levels of economic development. As a result of this process, the UNCITRAL texts are widely accepted as offering solutions appropriate to many different countries at different stages of economic development. The UNCITRAL Law Library is the specialized trade law library of the United Nations. It was established in 1979 in Vienna as a reference and research library for the Secretariat and participants in intergovernmental meetings convened by UNCITRAL. The UNCITRAL Secretariat has established a system for collecting and disseminating information on court decisions and arbitral awards relating to the Conventions and Model Laws that have emanated from the work of the Commission. The purpose of the system is to promote international awareness of the legal texts formulated by the Commission and to facilitate uniform interpretation and application of those texts. Information to be made available to the public under the Rules on Transparency shall be published by a central repository, a function undertaken by the Secretary-General of the United Nations, through the UNCITRAL secretariat. Information shall be published via the UNCITRAL website.